There are various components of your vehicle that require a little extra care when you are cleaning the vehicle. 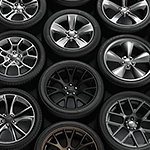 It is important for you to know how to clean your tires and wheels. When cleaning your car, the tires should be the first thing that you focus on. They are not only an important part of the vehicle but you are going to get the rest of the vehicle messy when you are cleaning them. Clean the tires before the rest of your vehicle so that you do not mess up its freshly cleaned finish. Always clean the tires and the wheels of your vehicle one at a time. Take time to clean the whole tire and wheel before you move on to the next tire and wheel. This will help you finish with the best clean look. You will find that doing this will keep products from drying on the tire and wheel before you have the chance to put them to use.